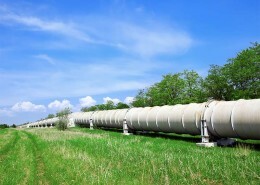 GEORES was born as a company with the aim to developing and industrializing the technical achievements of the academic research in order to spread know-how and technologies in the field of GEOfluid REServoirs. 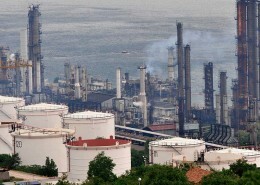 GEORES is an innovative reality providing integrated multidisciplinary services aimed at production and environmental sustainability of geofluids (mineral and hydrothermal waters, geothermic fluids, oil and gas) as well as Gas and CO2 storage related activities, and export of academic knowledge in the industrial world, by organizing specialized and personalized training courses. 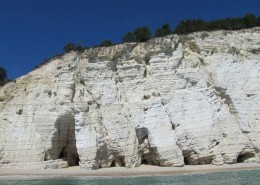 The services and products offered by GEORES are based on more than ten years of research focused on reservoir characterization in carbonates and siliciclastic rocks. 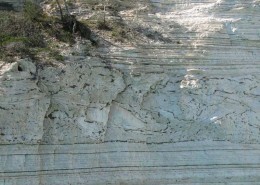 The sedimentological and stratigraphical study of sedimentary rocks is referred to the processes responsible of the development of their petrophysical properties. 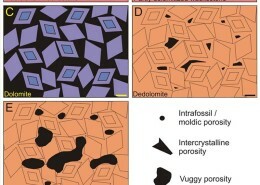 Our study integrates field and laboratory analyses in order to assess the most important sedimentologic and diagenetic factors controlling the preservation and modification of the pore-network characteristics (i.e., porosity, pore types, sizes, shapes, and distribution) in different siliciclastic and carbonate rocks. 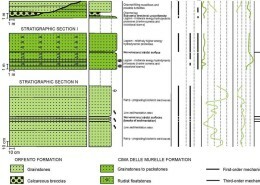 Quantitative estimations and new attempts for correlations among several sedimentological (grain size, sorting, shape factor), compositional (percentages of different types of grains and cements), and pore-network parameters (porosity and some pore geometrical descriptors) are provided. 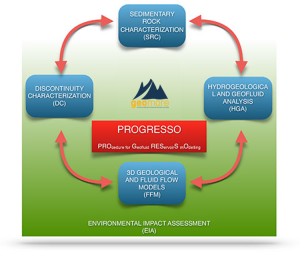 The ultimate goal is to contribute to a better interpretation of depositional units characterized by peculiar petrophysical properties, which could be related with the development of specific deformation processes and the typology and characteristics of the related tectonic discontinuities. 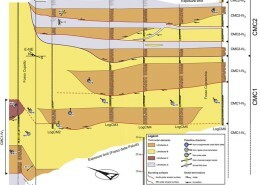 Geologic mapping (at different scale). 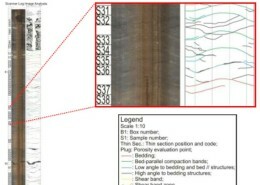 Stratigraphic and sedimentologic logging carried out along laterally and vertically extensive outcrops. 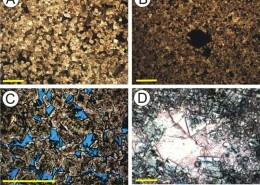 Petrographic analysis, to qualitatively document the sedimentologic (e.g., grain types; textures) and diagenetic characteristics (e.g. 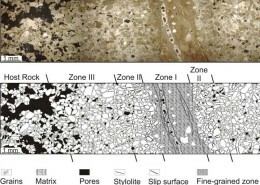 cement types and distribution; compaction evidence), as well as the types and distribution of macropores (pores with diameters >20 µm). 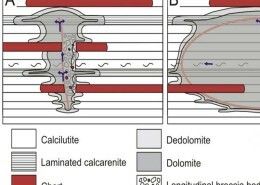 Cathodoluminescence (CL) microscopy, on selected polished thin sections to assess the diagenetic environments where the cements precipitated. 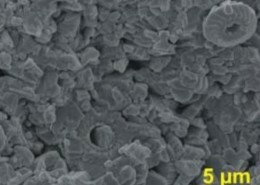 Dissolution of powders of selected rock samples using diluted hydrochloric acid to determine the insoluble residue (vol.%). 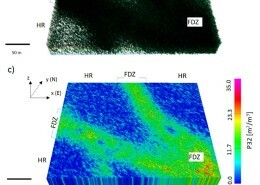 X-ray diffraction analysis of powders on selected rock samples to determine their mineralogical composition. 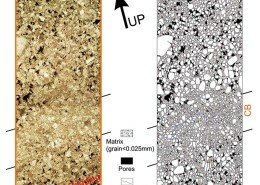 Digital image analysis of microphotographs to quantify the sedimentologic rock parameters (grain size, sorting, shape factor), the percentages of different rock components (grains, matrix, cements, two-dimensional [2-D] porosity), as well as some pore geometrical descriptors. 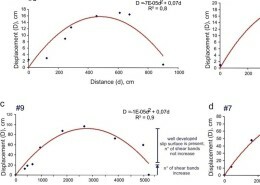 3D connected total porosity measurements of rock facies performed by means of Hg porosimetry and Micromeritics and Multivolume Helium Pycnometer. 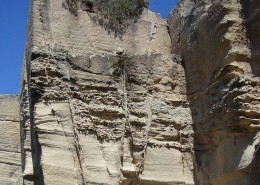 Permeability analysis in laboratory and in the field of rock facies. 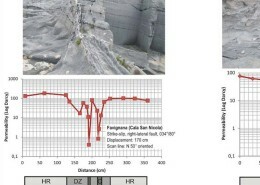 Vp and Vs analysis to individuate and investigate rock anisotropy. 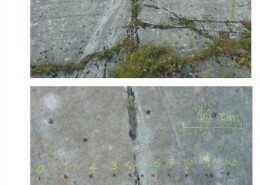 Electrical conductivity and formation factor analysis in laboratory. 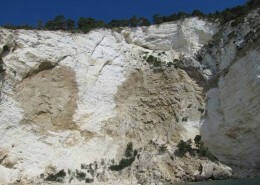 The structural and physical-mechanical analyses of the discontinuities affecting several lithotypes (i.e.siliciclastic turbidites as well as platform, slope and ramp carbonates) are focused on the study of faults nucleation and growth, and to the implications on the development of different structural components of fault zones. 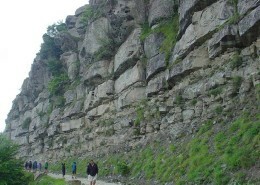 Moreover, the structural fabric and the spatial distribution, as well as the granulometric and hydraulic characteristics of cataclastic fault rocks, may be related to the sedimentological and petrophysical properties of the protoliths and fault displacement. 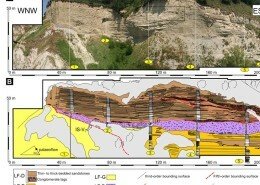 Systematic acquisition of data related to the geological indicators of the deformation mechanisms that are responsible of the development of the fault zones. 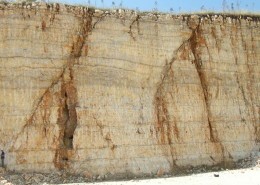 The characterization of the dimensional parameters of fractures (length, apertures, spacing) and faults (displacement profiles of individual faults and/or fault systems, thickness of fault core and damage zone). 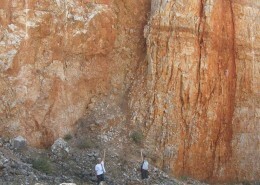 The accurate definition of the chronological activity of fractures and fault zones. 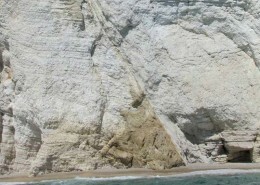 The determination of the stress conditions in which structures formed. 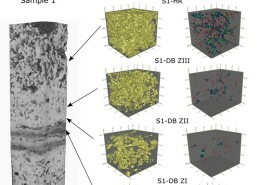 Optical microscopy, SEM and X-ray computed microtomography analyses for the microstructural, morphometric and granulometric fabric characterization of fault rocks, both in poorly cohesive and non-cohesive cataclasites. 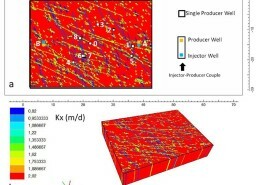 3D connected total porosity measurements of fault rocks performed by means of Hg porosimetry and Micrometrics and Multivolume Helium Pycnometer. 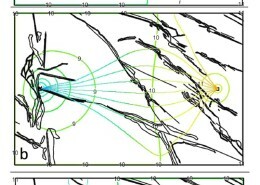 Permeability analysis in laboratory and in the field of fault zone components. 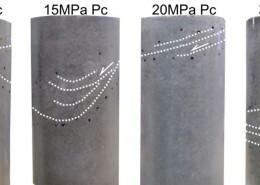 Triaxial experiments on cataclastic fault rocks for the characterization of the mechanical behaviour of fault zones at different scales. 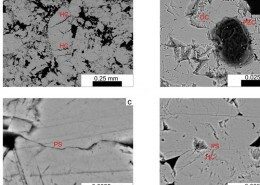 Surface and subsurface hydro-structures definition supported by chemical analysis of fluids, palaeofluids and fluid inclusions. 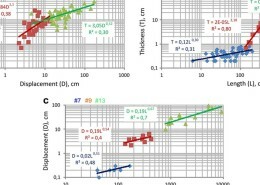 These analyses provide valuable information concerning the density, composition and temperature of fluid entrapment during diagenesis and deformation, defining its origin and physical-chemical variations in space and time. 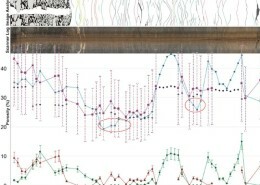 Taking into account speed, simplicity and low cost of this analysis, NIR technique is used for the direct evaluation of macromolecules in crude oil. 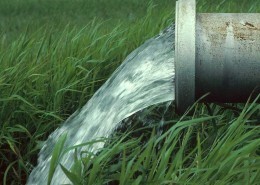 Geochemical analysis of fluids originating on the surface (seepage of meteoric water) and in depth (thermal waters, hydrocarbons). 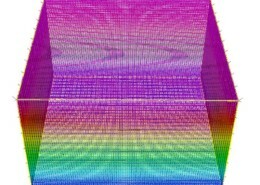 NIR (near infrared) spectroscopy analysis. 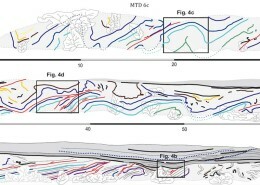 3D modelling of the permeability anisotropy imposed by structural heterogeneities on flow of fluids originating on the surface (seepage of meteoric water) and in depth (thermal waters, hydrocarbons). 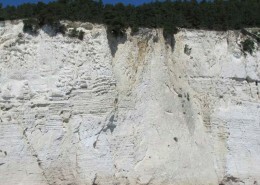 The fluid flows is modelled in different kind of fault zones where information concerning the sedimentological, stratigraphical, structural and petrophysical characteristics of the faulted sedimentary sequences, together with the the data relative to the internal structure (also in terms of porosity and permeability) of cataclastic fault rocks, are available. 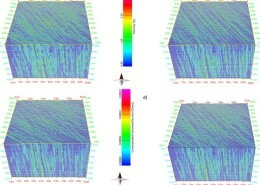 DFN modeling through analytical means, numeric modelling and up-scaling techniques, based on stochastic (percolation theory) and geometrical 3D models (using specific software). 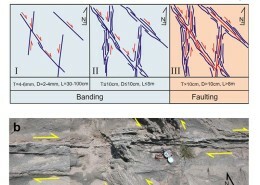 DFN models allow to integrate fracture attributes such as opening and length that are used to compute porosity and permeability of the rocky mass. 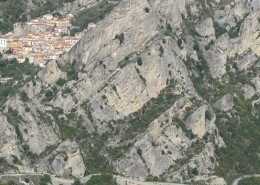 Fluid flow simulation within deformed rock. 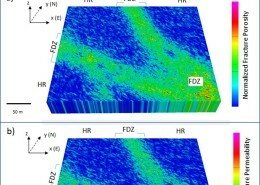 The constructed models allow to link several parameters concerning: i) the correlations of the variation of fracture properties developed at different confining pressures and temperatures in the different rock facies; ii) the relations between fracture density, the geometric anisotropy factor and the percolation threshold; iii) analytic and numeric tools to describe the fluid flow in a discrete fracture system. 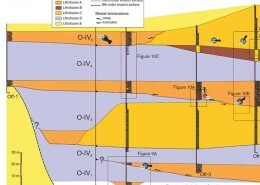 Prediction of the environmental consequences (positive or negative) of any activities related to both geofluids recovery activities or GAS and CO2 storage in the subsurface, proposing measures to adjust impacts to acceptable levels or to investigate new technological solutions. 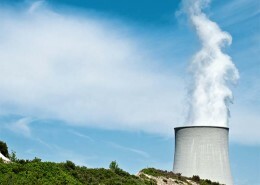 Comparison of the cost of the project and its impacts and direct / indirect project benefits.